I have a huge chicken breast defrosting and I'll be doing my Chicken Nacho bowls for dinner. Cooked this beef brisket yesterday and finished it off today with garlic cheese mashed potatoes & green beans. 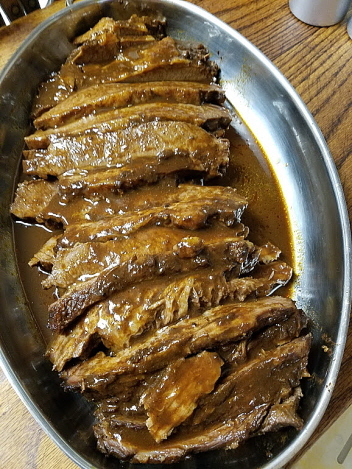 The sauce was Mikee brisket sauce. I’m BBQ’ing some Torrance tri-tip! That looks just wonderful Joey. I love that container you have there and I wish I had one just like it. Is it something you've had a long time or any ideas were I could find it? Tonight's gustatory delight was a hamburger casserole and tossed salad. Looks great, S&P..I love my beef! I made cauliflower-cheese soup, using my boat motor and my Velveeta. And a bit of chili-garlic paste. Went the German route tonight with an Octoberfest sausage, spaetzel, and some cabbage in sour cream that looks like cat puke..it was good, though. That's a local mustard that my brother gifted me..has some red chili in it. 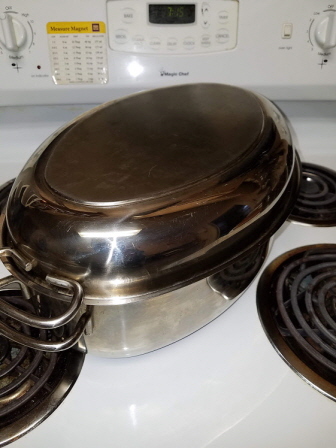 Hi Kayelle, It's the lid from a baking pan that is out of binsness. And I have two of them, one is still in the box. Curried mince on toast. Quick meal tonight.